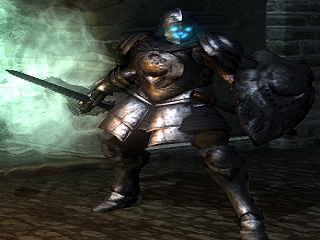 Blue Eye Knight is an Enemy in Demon's Souls. Simple Strategy- Keep your shield up and get right in his face, which will almost certainly trigger his shield bash attack. This has a long wind up and even longer recovery. Just backstep to avoid the blow and then attack. These are the weaker versions of the Red Eye Knights, but still pack a punch. Try to keep your distance and bait them into attacking. Their sword movements tend to be slow, so quickly counter with an attack of your own once they miss. If they come up close for a shield bash to break through your guard, back away! Don't be overly aggressive or you will burn through your stamina and likely die. They have a momentary recovery animation once they commit to heavy strikes at the end of their combos. Once injured they will try to heal with Moon Grass. This is your cue to strike quickly with a hard blow, usually enough to finish them off completely. Something else to consider is parrying. When the blue eye knight does a vertical swing, simply parry his attack and then riposte. This will most likely kill them in one hit. Some knights forgo their shield and two hand their weapon instead. These guys have faster attacks, tend to use combination strikes more often, and do more damage. You do not want to be caught by their combo attacks, or you will most likely die. Keep them at bay with spear pokes. Or, if brave enough, bait their combos and initiate your own between their swings. Without a shield, and wearing that heavy armor, they cannot do a thing against your onslaught. Casting spells between their attacks brings them down very quickly, or just cast spells against their shield to break their guard.